If you’ve just embarked on a lavish office re-design, invested in fancy new treadmill desks and installed a gym for good measure, you may want to look away now. New research suggests that office workers actually want something far more fundamental. A poll of 1,614 US employees by HR advisory firm Future Workplace found that access to natural light and views of the outdoors are the top most valued attributes of the workplace environment. The research, “The Employee Experience”, found that the absence of natural light and outdoor views can be detrimental to the workplace experience. Almost half (47%) claim they feel tired from the absence of natural light or a window at their office, while 43% report feeling “gloomy” because of the lack of light. But this is actually nothing new. Earlier this year, BE Offices and Dr. Kerstin Sailer of Brainybirdz found that greater exposure to daylight can improve productivity by as much as 20%. In 2017, in a Leesman study of 250,000 employees worldwide, 75.8% stated that natural light is important to them, yet only 56.9% were satisfied with the offering in their workplace. In 2016, the Global Human Spaces Report found that natural light is the #1 desired natural element in workplace design. In 2013, Psychology Today reported on a study titled ‘Impact of Workplace Daylight Exposure on Sleep, Physical Activity, and Quality of Life,’ and found that compared to workers in offices without windows, those with windows slept an average of 46 minutes more per night, and had better outcomes in quality of life measures. 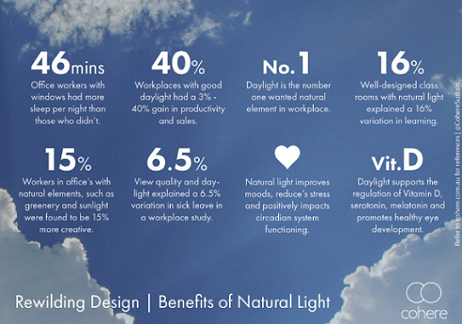 All of these findings show that natural light is a key component of workplace wellbeing. And with healthier workspace design now at the forefront of the coworking movement, operators can’t afford to let one of the most important elements of a positive workplace experience fall by the wayside. However, lack of natural light is not an easy problem to fix. For a start, the majority of workspace centres have been designed to maximise available floor space, and that means many have internal office suites without windows or views. Even external offices with windows and large open-plan spaces can come up against a lack of natural light, for example if the space occupies a lower floor, or is based in a city centre surrounded by taller, light-blocking buildings. Where natural light is limited and re-design can’t improve the situation — by removing walls, fitting interior glass partitions, or installing skylights — advances in lighting solutions enables spaces with low levels of natural light to be vastly improved. In a 2018 interview with Allwork.Space, Vince Pan, founder of Boston-based Analogue Studios, discussed the “tricky” aspect of lighting and its importance in the health and wellbeing of office workers, which is also a key component of WELL building standards. For WELL certification, the lighting needs to change colour and temperature, just like the natural environment throughout the day. But for workspaces that don’t (yet) require such a complex infrastructure, low-glare LED panels and ‘daylight’ bulbs can help to mimic natural light. It’s important to consider overhead positioning and coverage to avoid shadows and glare, with task lights positioned close to desks or other work areas to provide greater illumination for focus work, where necessary. Choice of decor plays a role too. One pro tip is to use light, matte colours and paint finishes on walls to reduce spot glare, which also reduces dark shadows and contrast. As Pan found out during the design process for WELL Building Standard, lighting is technically challenging to get right. If your space is lacking illumination, follow Pan’s advice and consult with lighting professionals. Long days in poorly lit workspaces pose problems such as eye strain and headaches, not to mention the aforementioned feelings of fatigue and “gloominess”. Where wellbeing is at stake, it certainly pays to invest in the right solutions to help keep your workspace members healthy and happy.